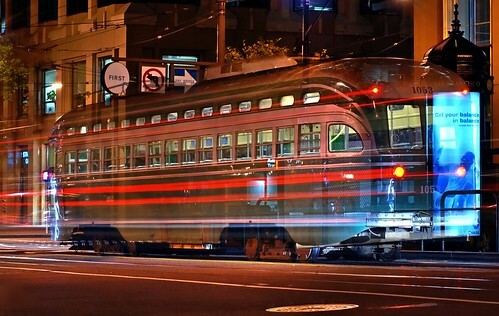 This great picture by Patrick Boury is just one of more than 3,000 F-line and cable car pictures on Market Street Railway’s Flickr group. It’s No. 1053, the “Brooklyn Dodger,” crossing First Street, striped by the taillights of passing vehicles. By the way, the original name of the Giants’ arch-rival team (both when in New York and now) was the “Trolley Dodgers.” So No. 1053 is welcome in our town, even if the team named for the trolleys isn’t. Category Photo of the Moment | Bookmark the permalink. Great photo. Could it be a candidate for the 2012 MSR calendar?